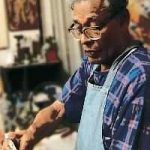 The paintings used in the About Us section of the website are works of Abdur Razzaque (1932-2005), a renowned sculptor and painter from Bangladesh. He was the first Fulbright Scholar from Bangladesh (1955-1956) and was awarded Ekushey Padak in 1989. Other photos and images used in the website are sourced from pi STRATEGY, CGAP, Flickr and Unsplash. A detailed list of the photo credits will be updated soon.